Admittedly, Carl Friedrich Gauss is still my hero. So, in commemoration of the 231st anniversary of his birthday, I've drawn this sketch of him, and one of my favorite quotes said by him, which I wrote in Latin. It says: "Si ceteri vera mathematica meditentur ut penitus ac perpetuo meditatus sim, mea inventa faciant." In English, "If others would reflect upon mathematical truths as deeply and continuously as I have, they would make my discoveries." I've written the dedication in Latin because Gauss commonly wrote his publications and probably most of his math journals in Latin. I know he looks kind of sad in this drawing, but his life was kind of sad in a way. His wife died after his third child was born; five years after he married her, his main supporter, Duke Carl Wilhelm Ferdinand also died, he made few personal friends, due to the high level of his genius and isolation, and some enemies, due to the fact that he would not acknowledge their work, claiming it was his own (his journal and posthumous papers revealed this had been true), suffered hypochondria and melancholia, particularly in his later life, and was ill for most of his later life. And yet, none of these things stopped him from being the magnificent man that he was, the kind, gentle and calm being of great genius, who disliked conflict and did not preach religious intolerance, and perhaps sensitive, yet strong in spirit and intellect. 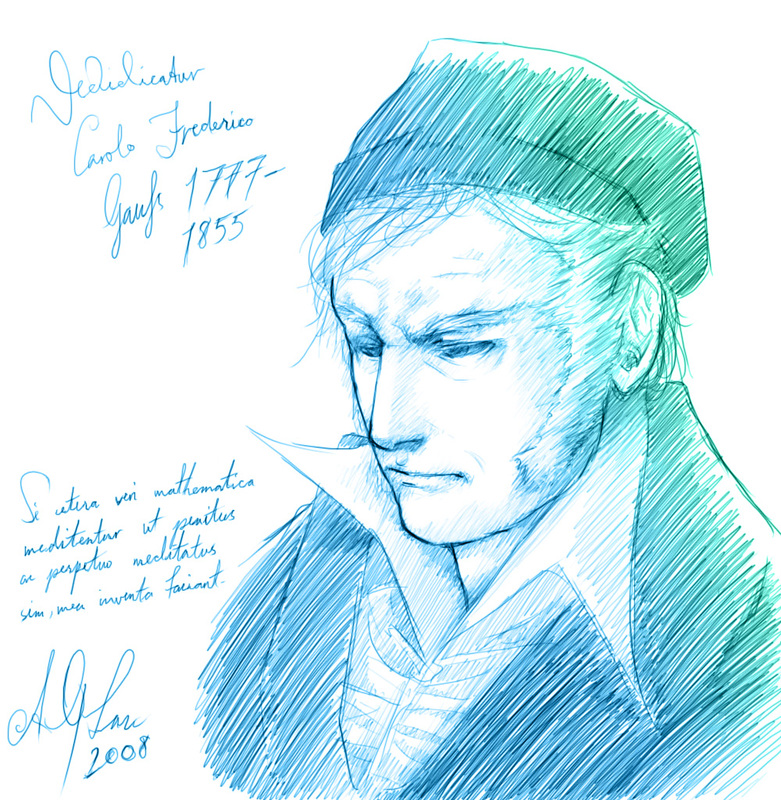 For those interested, Gauss' name in Latin (nominative) is Carolus Fredericus Gauss.